The hens came running for their spinach and bread. No tail feathers missing. “Good girls,” I said and stepped inside their house for my water, feed, and possum check. When the temps dipped to 10 degrees while ago, a young possum found a hole in the pen’s chicken wire before we did. The critter waddled up the hen’s ramp, through the chute and hid in the house. My husband saw the intruder hiding under the feeder and sent it home to Mama. He repaired the fence and closed the chute at night. Two days later I spied its black beady eyes in the straw and pushed the rascal out the back door. Entirely ungrateful for the night’s lodging, the varmint turned and hissed. We repaired the pen again. Chores done, I climbed the hill to our muddy road. Fog fell in drops from dried oak leaves. The milky atmosphere tugged at a memory I couldn’t place. Although walking on a winding road in thick fog is dangerous, it’s also illuminating. With the air at 54 degrees, I recalled the contrasting Januarys of my childhood and child rearing. Growing up, January meant holding a hot water bottle to my ear while my sisters played outside in the snow. As a young mother, January meant my turn to be homebound with sick kids. January of 1977 and 1978 were bitter cold with record-breaking snowfall. The temps didn’t reach above 20 degrees. The snow remained three feet deep. In March 1977, our four-month old baby, now forty-years old, was hospitalized in intensive care for two weeks. A glorious Easter followed her discharge and recovery from surgery. She nursed, the sun upon my face and green grass under my bare feet a blessed resurrection of life. After more than twenty years an empty nester, my maternal instinct still abides and guides my life. 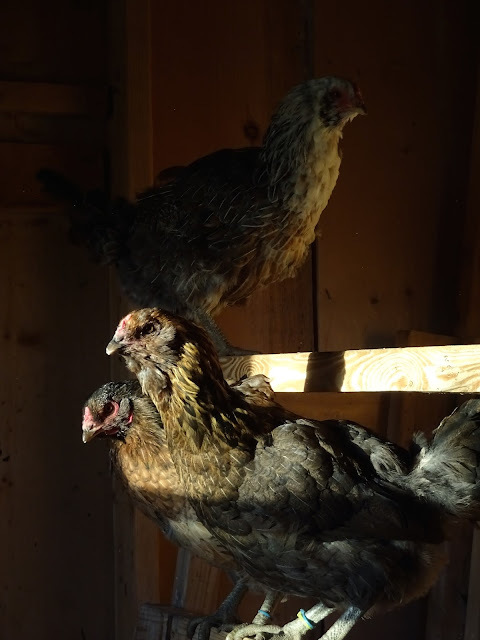 That’s why I yearn for my dearly departed—why I love and need to care for our hens and cat. And why my mother held onto her lap cat in her last years. It was dusk when I walked into my kitchen and cooked chicken lemon rice soup, waited for faithful memory to speak. And she did. I stood on the hump of the backseat floorboard. Dad hovered over his steering wheel in tense caution, billows of white clouds swallowing our windshield. Mom held his coffee thermos, speechless. I was not afraid. Dad knew his mountains. As he drove onto a farm’s rolling landscape, the sun burned off the last swaths of fog. Our southern kinfolk were happy to see us safe and sound. And we were glad to see them—to have our feet on the ground. Dear Reader, God’s presence envelopes me when I remember Dad driving into clouds. God knows my roads and mountains better than I. “Do not be afraid,” He says. In trust, I take one step forward in the fog. Then another. That’s all I need to do to reach my destination. His loving arms enfolding me with sunshine.